Today's post was supposed to feature Amelia's 6 month photo shoot. We were scheduled at 10:45am last Friday, but Amelia fought her morning nap and refused to go down when she usually does. At about 10:15am, she finally crashed and I made the judgement call to skip the shoot and reschedule for this week (sometimes, sleep is the most important thing, am I right?!). Usually, this isn't a big deal as our photographer is a family friend and very flexible/accommodating. Unfortunately, Nebraska weather has NOT cooperated with us at ALL and it has been gloomy, rainy and miserable all week. We all know that natural lighting is key to a good shoot, so still no photos. I am hoping tomorrow will be nicer for the very first Nebraska Husker game of the season and we can get some good pictures taken in the morning! That being said... Two weeks ago, I introduced myself, but I didn't let you all get to know miss Amelia. I would love it if you Confetti Babe readers would play along and let me know some facts about your littles; it doesn't have to be 10 like my list! Amelia was born on our six month wedding anniversary. I have always had a thing about "1/2" milestones, so this was really exciting for me! I can't wait to celebrate our anniversary and her 1/2 birthday every year together in August! 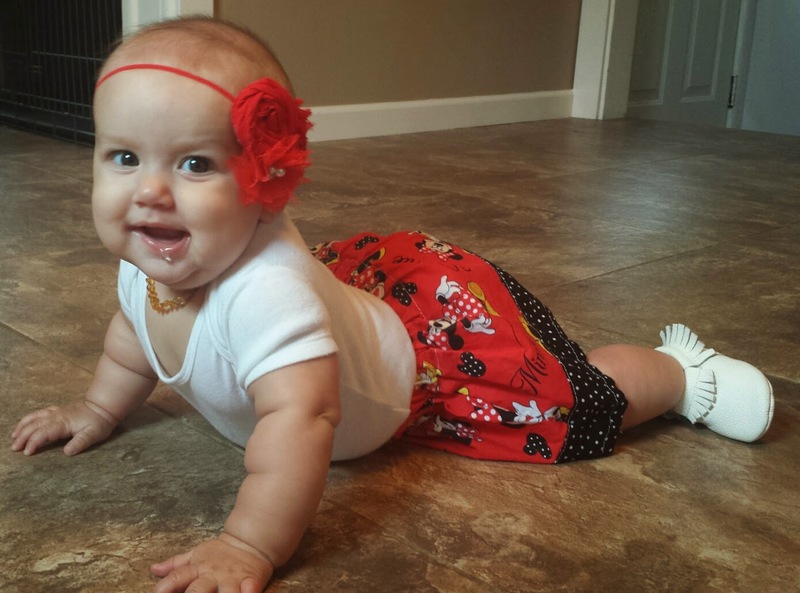 Amelia is SO close to crawling at only 6 months!!! She rocks, planks, scoots forward and backward, flings herself forward... but she can't quite figure out how to move her arms and legs at the same time to actually crawl. This momma is so NOT ready for her to hit this milestone. How does time fly so quickly?! 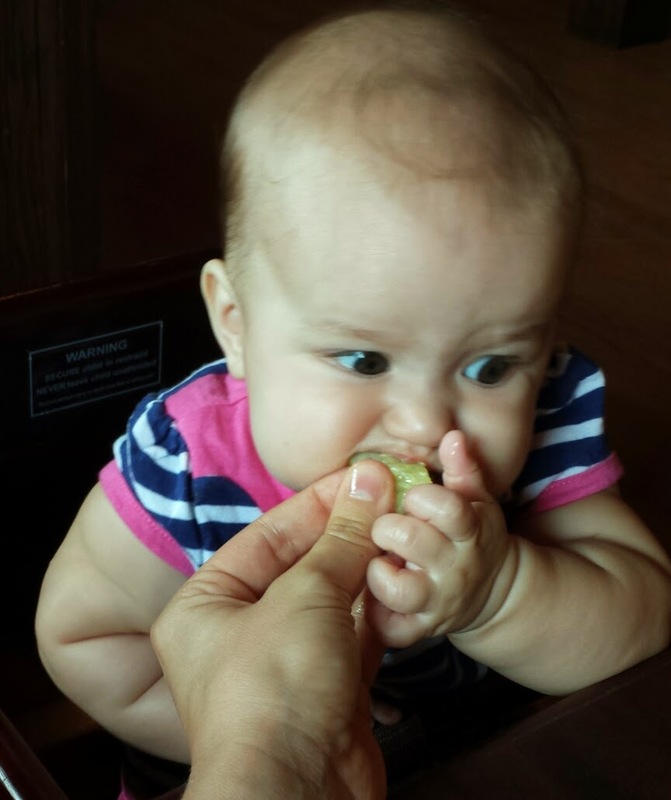 We are attempting BWL (baby led weaning) in our household. So far, it is going great! No gagging or choking, and with absolutely no teeth to speak of, I am pretty impressed. So far, her favorite foods have been guacamole, baked beans, pickles and chicken. Amelia is the only one of all her cousins who does NOT have blue eyes. All seven cousins on my side of the family and two (there is another on the way!) on my husband's have some form of blue eyes. Right now, Amelia's eyes flirt between brown and green. I am thinking they may settle on hazel, but only time will tell! We do not co-sleep in our house. This is not for lack of trying; I really wanted to! Amelia, on the other hand, has always wanted her space! She has been sleeping in her crib since she was a month old. I also let her sleep on her tummy because she has had amazing neck control from birth. This might not make some mommas feel comfortable, but it worked for us! Currently, Amelia is a side sleeper and it's the cutest thing I have ever seen! 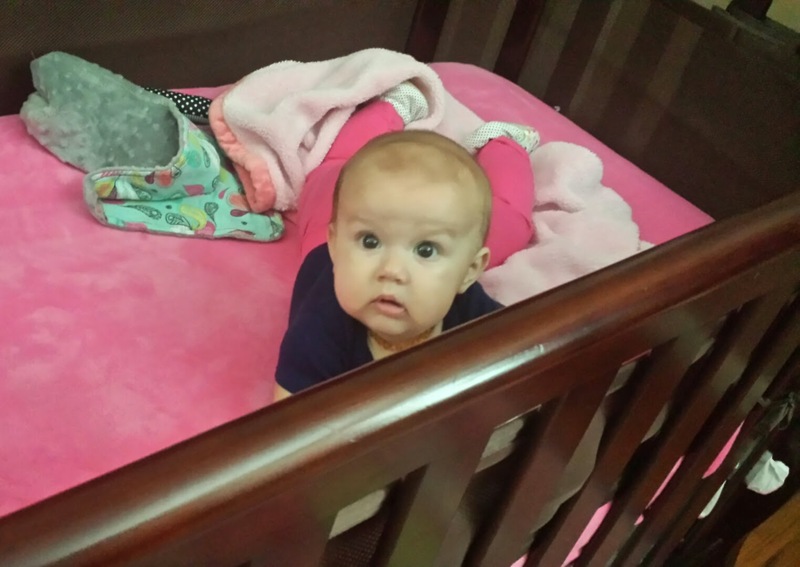 It's so fun to see these eyes peaking out at me from her crib! Since I have already mentioned Amelia's cousin's (she has 9, soon to be 10! ), I will say she is the "luckiest" of them all. 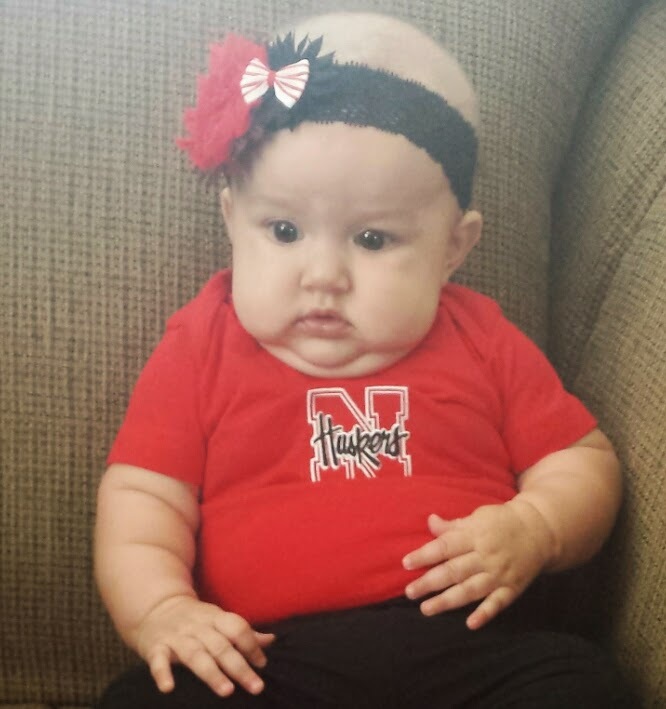 Amelia is the ONLY grandchild in the same state as her grandparents! We are very fortunate that both Brandon's parents and mine have stayed put in Nebraska. Although I would have liked to move away from home at some point, even for just a little while, I cannot imagine leaving our family now! Amelia loves to be startled/scared. I do not know where she gets it from as both her dad and I hate it! Things that would make most babies cry make little miss Amelia smile from ear to ear. When the dogs bark at nothing and I about jump out of my chair, I look over and Amelia has a huge grin. The best way to get her to smile for the camera is to ignore her and then "ROAR" at her. While it might sound crazy, it totally works! This little girl does not giggle yet! We have tried just about every trick anyone has given us to get this peanut to chuckle, but nothing has worked. She has a fake cough that she does often and we can occasionally get a "ha" out of her. But so far, no full belly giggle. I was concerned as I have never encountered this before (first time mom and all), but our pediatrician assured me she is just fine developmentally and she will laugh in due time. You would think this face would accompany a giggle... no such luck! "Jesus Loves Me" is her favorite song. When I was pregnant, I used to sing it in the shower and she would kick like crazy! It is my go-to trick to calm her down when she gets really fussy and we sing it every night before bed as part of our routine. She usually only makes to about the third verse before she succumbs to sleep. I only wish I had a better voice so she could hear what it was supposed to sound like! Amelia prefers anything that is not her toy over any actual toy she has. A plastic bottle, a keyboard, the chip bag, her pacifier clip, a baby spoon, the remote (what IS IT with babies and remotes?!)... these keep her entertained for several minutes at a time!!! She loses quickly interest in her Sophie, rattles, stuffed animals, touch and feel books, toy cars, just about everything we have purchased for her! Is every baby like this? We have actually given her a remote without batteries and her own keyboard and mouse to play with instead of ours to pacify her. Well, there ya have it! Ten random facts about my mini-me, Amelia Grace. I hope you enjoyed reading them as much as I loved writing them! Feel free to play along and let me know some facts about your babes! To Cloth or Not to Cloth?